In August of 2001, the subject yew was spotted on the way home from work. Most of its branches were already cut off and it was waiting to be removed to make way for new shrubs. 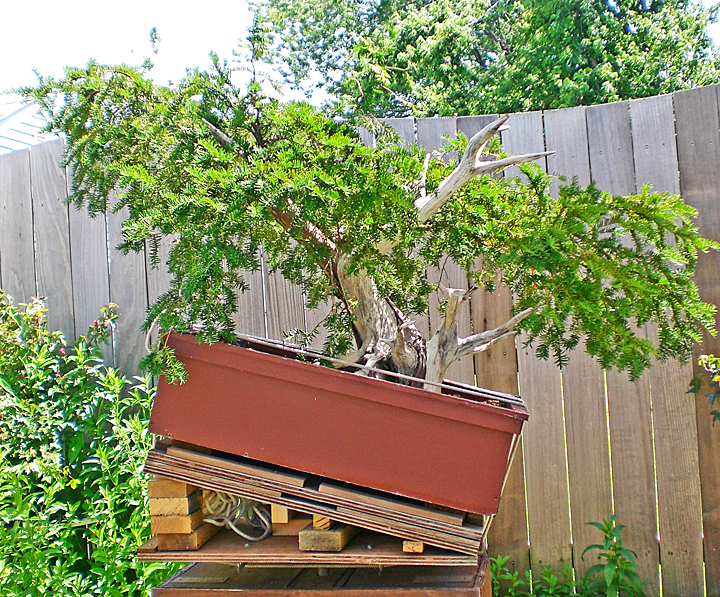 After obtaining permission, the following day the yew was removed very carefully, trying to protect as many of the roots as possible for a future bonsai. The work took two men seven hours in eighty-four degree temperatures. 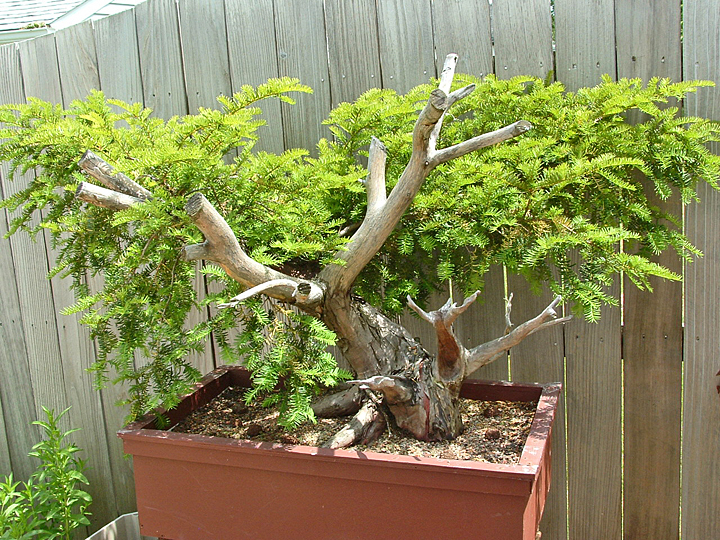 Below is the tree after being potted that afternoon. 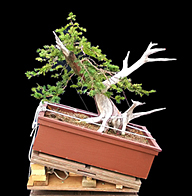 In order to minimize the stress on the tree, it was placed under a tent to keep it in shade for the rest of the summer. In addition, it was misted several times each day. 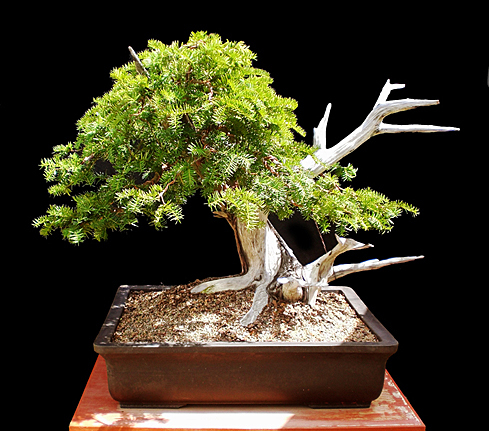 The yew was allowed to grow for the next three years. 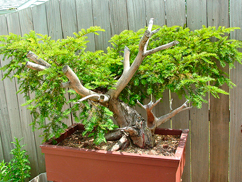 Then, in the spring of 2004 it was re-potted. It had developed significant foliage and was loaded with fibrous roots. 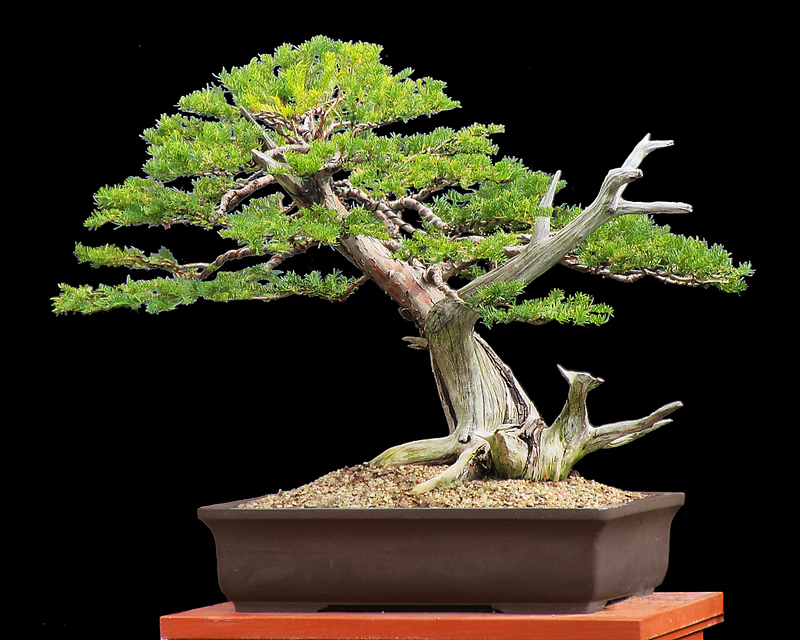 Because the tree was so large and heavy, a special base was constructed so that when it came time to style the yew, it could be rotated and tilted to the desired angle. Note the hinges on the four platforms below the new wooden box that the yew was placed in (below). The photos below show the carving of jin that took place in 2006. After soaking the wood with warm water, wood was peeled back with pliers. 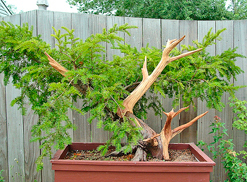 The yew did not look as healthy as it normally did in the Spring of 2007. It had gone through a tough winter. So rather than attempt to style it that year, it was decided to wait one more year. In June of 2008, after seven years of patience developing this old tree, the time had finally come to style it. 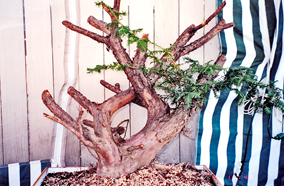 If you look at the significant growth on the yew in the photo below, you will see that patience had provide a wealth of branches to choose from to style this massive tree. 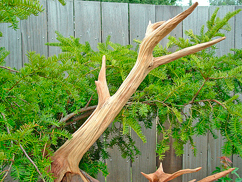 The finished Yew shown in bottom photo has a final size of 37” wide and 31” high. At its base, the trunk is 8”wide. It will be potted into a bonsai pot next spring. 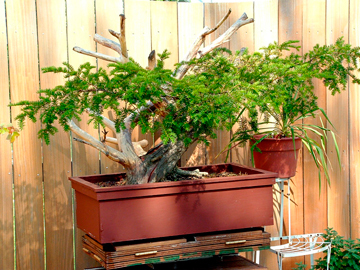 In August of 2009, eight years after collection (to the exact month), the yew was finally planted in a bonsai pot. At the same time, it was restyled a second time, rounding off the apex to take away the look of youth projected by a pointed apex. Note how much fuller the foiliage is after just one year since its first styling. A good portion of the bottom base of the trunk had to be ground out to get it to fit into the 7 inch deep pot. 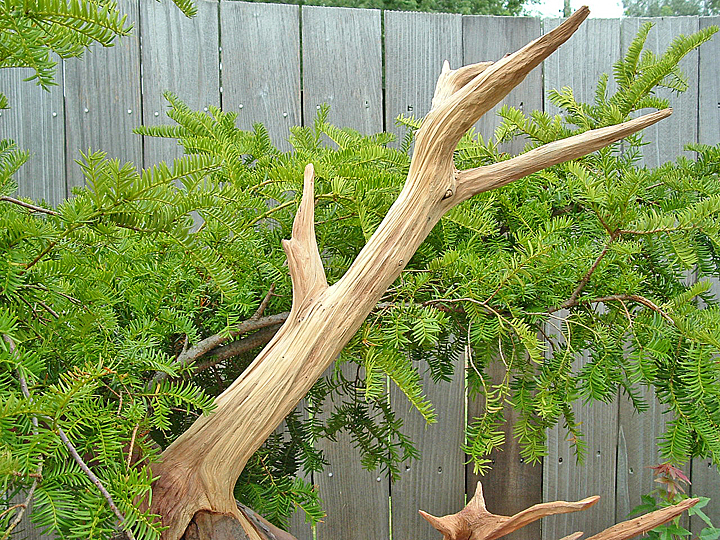 The final size of the yew is 36" x 27" with base of the trunk now at 7.5". Its pot is 27.5" x 21.5". After getting its bonsai pot in August of 2009, the Yew has had several re-stylings in the subsequent 8 years. Pictured below is how it looked on June 30th of 2017, just after it was trimmed & wired once again.